High Frequency is versatile tool that works on toning the skin. Produces the sensation of heat while it stimulates blood circulation and helps oxygenate the skin. Also has an antiseptic effect on skin effectively sterilizes skin and kills bacteria. Includes 4 glass gas filled electrodes specialized for: 1. Mushroom Electrode: for large areas (forehead, back) 2. Spoon Electrode: for sensitive areas (under eyes) 3. Sparker (zapper) Electrode: for spots like pimples 4. 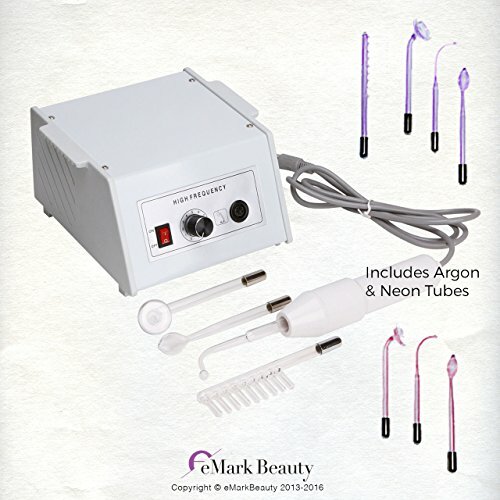 Rake Electrode: circulation and stimulation (scalp) CE Certified Frequency range: 60,000-200,000 hertz Wattage: 20w. Return policy will be executed under the following terms: Returns are accepted under the stipulation it is within 30 days from delivery date, verified by package tracking number. Buyer is responsible for return shipping cost in order to guarantee a full refund. If you have any questions about this product by eMark Beauty, contact us by completing and submitting the form below. If you are looking for a specif part number, please include it with your message.